When the homeowners at this Lacroix Bay home enlisted 3 Seasons for help in re-landscaping their back yard they asked for more usable space. 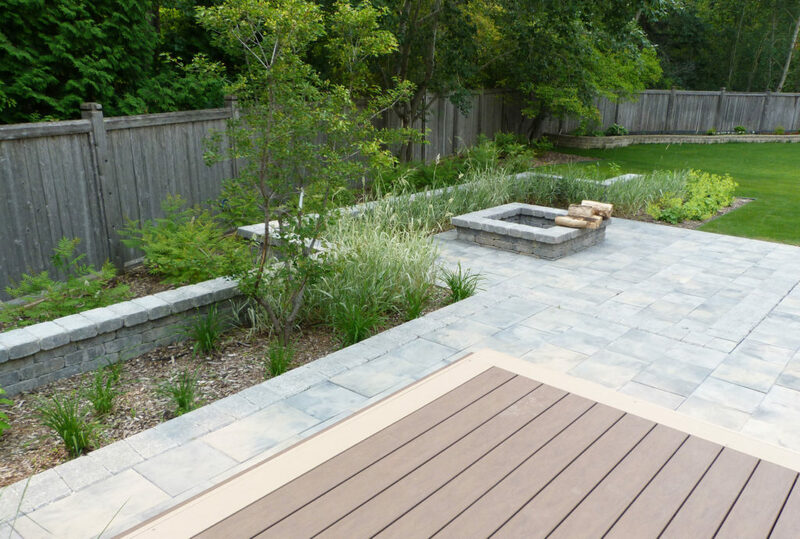 The existing landscape was a simple yard with a small deck, a lot of lawn, and little in the way of interest. 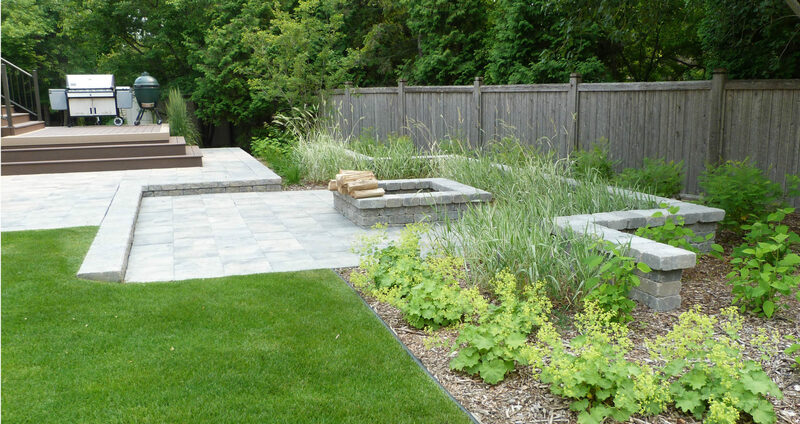 A design that uses grade changes, a contemporary geometric plan, and dramatic planting was implemented to give the yard more spatial definition and visual interest. Grade and height changes are used to create multiple functional spaces within the yard and materials were chosen to create a cohesive feel overall. The landing steps down to a BBQ and dining area which steps down to a patio lounge area which finally steps down to the focus of the yard – a large built-in fire pit. A low accent wall was built around the patios to provide a dramatic backdrop for plantings and to help make the space feel like an outdoor room. The landing and deck are made from dark composite decking with a matching metal handrail and the colour was chosen to stand out against the soft grey of the house exterior and paving. The retaining wall step separating the two patios is made of Barkman RomanPisa stones and the patios are constructed of Barkman Brookside Slab. 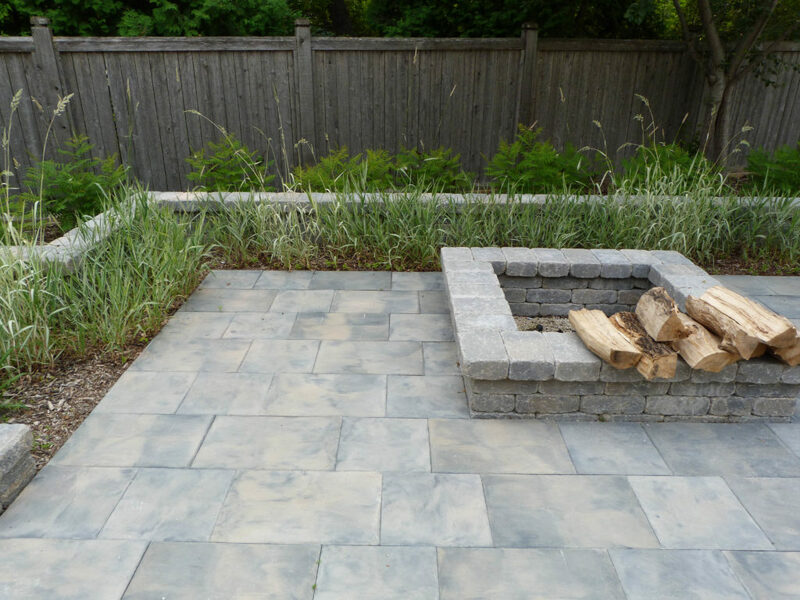 The fire pit and low accent wall are built of Barkman Quarry Stone. False Spirea is mass planted along the fence behind the accent wall. It will eventually grow to a height of six or more feet forming a living wall that gets showy, white sprays of flowers in early summer. Grasses are planted around the firepit and provide movement and playfulness up against the architectural elements such as the accent wall. The planting is completed with masses of Annabelle Hydrangeas, daylilies, and Lady’s Mantle. All three plants were chosen because they are low maintenance and have showy flowers that will open at different times in the season as well as beautifully textured foliage in order to provide season long visual interest. 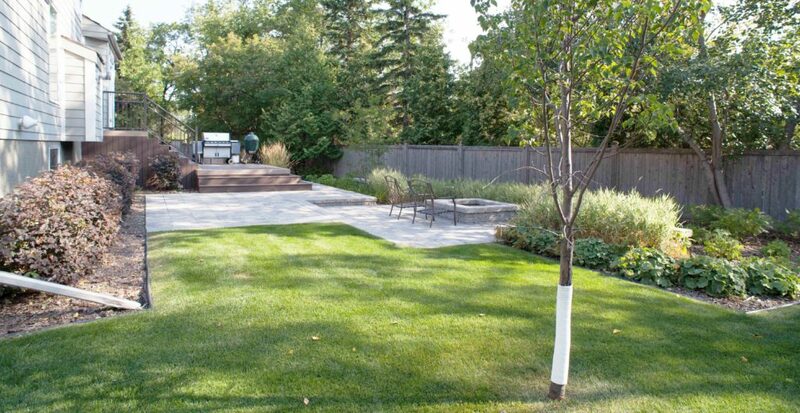 Strategically placed trees will provide the homeowners with privacy from neighbours while using their outdoor space. The choice of materials and plants will keep this yard a low maintenance oasis for years to come.